This is a privately owned unit and guests are renting directly from the homeowners whose company name is B&Z LLC (as will appear on your credit card statement). Therefore your reservation is non-transferable between other properties. Amenities provided by third-party vendors (for example utility companies or subcontractors) are beyond our control. We do our best to provide services such as cable television, fee-based internet (wireless password 6203guest), and resort telephones. Should these be unavailable for part or all of your stay we will do our best to help restore services, but ultimately cannot be held responsible. Should you absolutely require internet access we recommend you make arrangement for these services through a cell phone company. 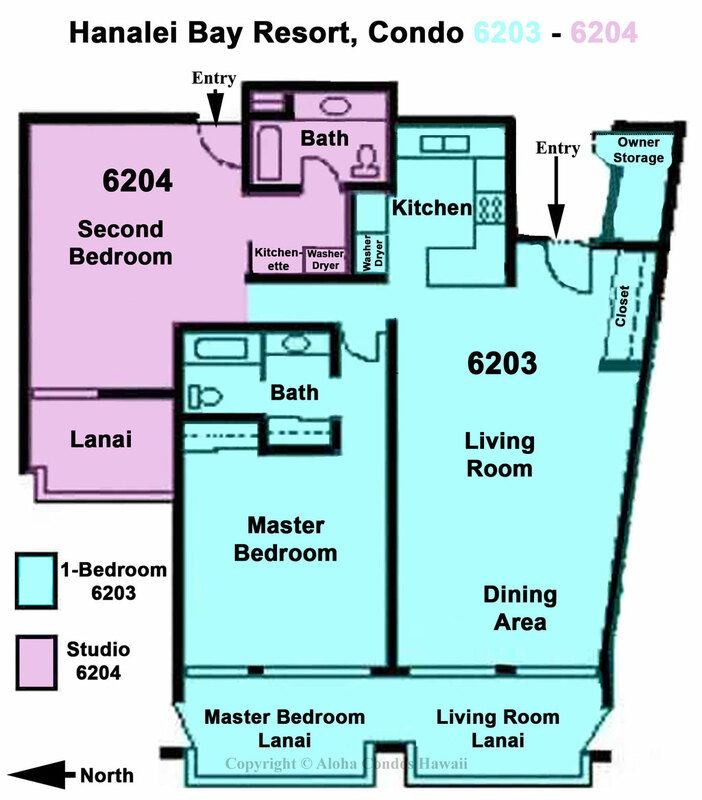 The regular occupancy for 6203 is 2, however 2 additional people can be accommodated on a sofa sleeper with a tempurpedic mattress in the living room. The regular occupancy for unit 6204 is 2, and a 3rd person can be accommodated on the sleeper chair. The regular occupancy for 6203/04 is 4. The maximum occupancy for 6203/04 is 7. Guests are obligated to disclose the actual number of occupants prior to arrival. We provide sheets for each bed and two bath towels per stated guest. There is no daily housekeeping service, but you are renting 6203 or 6204 you are welcome to use the washer/dryers in the units. If you have an interim clean included with your reservation we will launder the linens during the clean. Please do not leave personal laundry in the washer when housekeeping is coming for the interim clean. We just had an amazing 10 days at Condo 6203-04 at HBR. Very impressed with the beautifully furnished apartment that contained everything we needed to make our holiday perfect. The views were amazing, the facilities excellent and we were lucky enough to be there on the first day they opened the new swim up bar in the pool! The condo has everything you would ever possibly need for a holiday from beach chairs, to snorkelling gear and a fully equipped kitchen. We will definitely return in the future. Thanks for allowing us the ability to use this amazing place. This condo has an amazing view, but the carpet needs to be removed because of how humid it is the carpet makes the condo smell and seem gross and moldy. The walls need to painted a lighter and more neutral color, to make it more lighter and cleaner. The master bedroom needs a new bed spread that is not brown and much lighter in color. Brown bedspreads are gross. The kitchen needs to be updated badly too. We spent way to much money on this rental for what we got. I do not recommend this condo until it has been updated and cleaned. Thank you for your response to our request for a review for unit 6203/04 at the Hanalei Bay Resort. Your comments are appreciated. These units are advertized with multiple pictures so that you can see the colors of the condo if that is something that concerns you. These units are individually owned so individual tastes might be different then your as to the colors schemes. We are confused by your comment about the color of the bedspread also as that is a matter of individual taste again and we are not sure why you consider brown bedspreads gross?? The owner has updated some in past years but does have some plans out in the future to update some again but it is not scheduled as of yet. Meanwhile as mentioned before, the website is a good source to see what the condo does look like. We do have more pictures than most as well as videos. It really give you a good perspective. This was a very nice condo for our group of 7. We had 3 in the 6203 room, which has a king bed and a pull-out single bed that our 11-year-old slept on. We had 2 in the 6204 bedroom (king size bed) and 2 on the Q size pull-out sofa. The frame on the pull-out sofa was broken and very uncomfortable, so the two teens who slept on it had to pull the mattress off the frame and put it on the floor. The condo furniture was nice but a bit dated. The kitchen and bathrooms had all been redone and were very nice. The kitchen was well-stocked with dishes and pots/pans, and the owners supplied beach chairs, umbrellas, coolers and boogie boards. The Hanalei Bay Resort is beautiful and the pool is exceptionally pretty, with several waterfalls, plantings and a small beach area. We never found the pool too crowded and were always able to find a place to sit by the pool. The resort has a number of tennis courts that we didn't use. The view of the bay from the condo was beautiful. The beach is not close (there is a long steep path down from the resort) and is not visible from the condo, but the bay and the mountain on the other side is visible and very pretty. Great location for a quick walk to the beach and beautiful sunsets or to all the fun the area has to offer. The view from the lanai of the ocean and mountains was amazing! They had every beach toy available one could want and great beach chairs and towels. The grounds and pool are one of the prettiest I have ever stayed at and the restaurant had amazing views for evening dinners. The condo was clean but could use updating, especially the carpet as it has some bad stains. Other than that it was absolutely perfect! Thank you, we will be back! We thank you for your review responding to our request. The condo has incredible views and sunsets are special each day! We are glad you made use and enjoyed the condo amenites as well as the amenities of the resort. Thank you for noting the cleanliness of the condo and the updating is a matter of taste I guess with each individual owner and their styles. They have recently replaced some of the furniture. The carpets are getting cleaned this month as is an on going process. We just had an amazing 10 days at Condo 6203-04 at HBR. Very impressed with the beautifully furnished apartment that contained everything we needed to make our holiday perfect.The views were amazing, the facilities excellent and we were lucky enough to be there on the first day they opened the new swim up bar in the pool!The condo has everything you would ever possibly need for a holiday from beach chairs, to snorkelling gear and a fully equipped kitchen. We will definitely return in the future. Thanks for allowing us the ability to use this amazing place. The condo was absolutely a dream with a great view!! The condo had beautiful furniture with all the amenities. We spent four days and our next trip we will be there for a week. The only problem was that we could not figure out how to get more stations on the radio. We were listening to Shaka 103 FM Kauai in the car and couldn't wait to get to the condo to turn on the radio. We even called a technician but he couldn't figure it out either. Other than that we will surely return to the same condo 6203-04. Thank you for your wonderful review. We always appreciate the feedback and are happy to hear from our guests. This is a great condo as you mentioned and actually will be getting new furniture in the living area in the near future to make it even better. This unit has the most incredible views that adds to the whole Kauai experience and is a site that can never be forgotten. Radio stations in Kauai are very few and with the ones that do exist the reception is not so good. They go in and out and are hard to stay tuned but that is just one thing that comes with island living. We are happy to hear you will be returning to enjoy another stay in paradise. The views are awe inspiring but the care for the unit is regrettable. I have been coming to Kauai since 2008 and staying in the unit 6203 with every visit, almost annually. I have watched this unit from it's prime, well kept, gorgeous furnishings, a tenderness given to the care for each item within the unit and a high standard of pride by the owners. I felt that I was home each time I visited. When I married my husband and I started to visit and later I included my mother on these trips. This past October I arranged our travel plans and included another couple to join us. I walked into the unit, after only having been in the same unit this past April, I was heartbroken to see the continued diminishment of the space. My family, friends and I care for the space as if it were our own. I feel that it has become our second home. So you can see why the heartbreak. The coaches had their leather armrests damaged, the carpets were dirty, the kitchen counter badly scrapped, the towels were hard to use because of the smell, the sheets and bedding also have an unclean/lack of freshness to them, the screen doors leading to the lanai were off their tracks and would stay when we would try to open and close them, the supplies in the kitchen seemed sparse, and the dishwasher didn't allow for the soap to be used in the cycle. The list goes on. It is not the high quality unit it used to be. And for that I am sorry for the owners, because it was clearer from all that they had put into the space that they did so with much intentionality and love. I hope this helps, because I LOVE unit and should ever the owners want to sell, I would be happy to make an offer. It has grown to become a sacred space for me and my family. Everything about this property was wonderful.Views are stellar, beach access is easy to walk and even better if you need a ride back up the hill; they staff are willing to shuttle guests back to the room...24/7! !We had a suite for two couples; it was easy to share cooking and living space. Each unit had washer dryer.Our only complaint would be the the rather unfriendly female attendant at the rental area near the pool. She made absolutely no effort to educate our group about the use of snorkeling equipment even when one of our group stated that "it was her first time snorkeling".Posted on the white board was info about surf advisory, but she made no reference to any safety issues. She made us feel that we were an inconvenience. A separate incident with this same person involved a request for music poolside that was available the day before, but she stated that " she didn't have access to that" when in fact the equipment was sitting her feel...all while being on her cell phone.Amazing that one person can leave such a negative memory in an otherwise wonderful experience.All other staff were beyond helpful! Highly recommend!! Thank you so much for your review of the unit 6203/4 at the Hanalei Bay Resort. We are glad you found the unit and the accommodations to your liking and the resort a great place to be. The location certainly could not be better the views are second to done. We are so sorry that the attendant at the pool side shop was not very the friendly to you. Although they are independent from the resort, we will mention this to the resort manager and let them know about your experience. We are happy that you found the rest of the staff friendly and accommodating. We hope that you will come back again. Mahalo for your business. If your looking for a place to be quiet this is it. Nice condo and great resort. The only sad note is the awful smell in the small condo 6204 they need to do somethihg about this would not recommend it because of that, everything else is great. Would have rated it very good if it was not for the smell problem in 6204. If you only rent 6203 is very good but they need to update the applainces the stove is pretty outdated. I was worried about check in since we landed at 9pm and didn't get to Hanalei Bay Resort until after 10pm. Check in was easy and they even escorted us with our luggage via shuttle cart to our condo. The 2 bedroom condo was beautifully furnished and was very comfortable. The view from the lanai was incredible. The furnishings were luxurious and very spacious. We loved the big screen tv and comfortable couches in the living room and all the living spaces including the lanais. The view and connecting extra large lanais were the best. We could have used a 4th chair on the lanai for breakfast since we had 4 in our family. I wished the 2nd bedroom had 2 beds vs. king bed for my children. We also loved the lounge chairs on the lanai off of the main bedroom. My husband experienced a shoulder injury and could not sleep comfortably in the bed. He spent many hours dozing on the chair in the living room which he claimed was a life saver! The worst part was we were worried that we would run out of toilet paper (so an extra roll or 2 would be nice for our 9 day stay). The kitchen was well stocked and loved having coffee pot and blender. Nice of you to have extra paper towels, sponge, dish soap, coffee filters, sugar and all the critical essentials. Thank you for the welcome basket with coffee, cookies, water and macadamia nuts. To have coffee in the morning was essential especially since we were awakened by the roosters at 5am! We did finally adjust to the roosters but wish that they didn't control all of Kauai! We had a fantastic stay. The views were amazing. We loved sitting on the deck at sunset. The home was very nicely decorated. As soon as we walked in the door we knew we had picked an incredible place to stay. We definitely would go back and have been recommending the condo to our friends. We enjoyed exploring Hanalei Bay. We grilled fish from the fish market poolside one evening and also tried the various restaurants. The only complaint we have is that our stay was too short.